I had the Stuffed Crepes Supreme and I liked them! As the menu appetizingly states, the Supreme consists of two golden crepes stuffed with scrambled eggs, jack and cheddar cheese, sausage and crisp bacon and topped with jack and cheddar cheese and sour cream. It wasn't false advertising. The crepes were indeed golden and the bacon was truly crispy. The combination was a total success. The crepes, with their refreshingly spongy texture and hint of sweetness served as an ideal casing for the barrage of well-prepared breakfast foods. Be forewarned: this is a huge meal. The two crepes were huge compared to breakfast crepes I've had at other restaurants. If that isn't enough, the meal comes with two buttermilk pancakes and hash browns. Considering the prices these days at IHOP, Denny's and their ilk, the $6.99 prices tag seemed almost reasonable. Of course, the bill escalates to $9.40 after a cup of coffee and argghh... $.72 tax. A couple tables away, I could hear a Hollywood health sissy ordering. "Oh yes hello... I would like an egg white omelet� no fillings... and please have that prepared with cooking spray instead of butter. And I'd like two Harvest pancakes, also prepared with no butter." Ordinarily I'd have admiration for that kind of healthy eating. But this morning, I just felt sad for him. He would probably never experience the Stuffed Crepes Supreme. I sensed that there was sadness in his life. 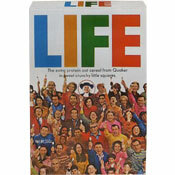 He was life-destined party-pooper, because "the drinkers" in high school made a joke. They were just ribbing him. They meant nothing by it. Now, he's miserable because it takes more energy to defend your personality flaws than to change them. Maybe I saw part of myself in the man. The me that was me before I became Mr Breakfast... a large happy man with huge plate of stuffed crepes... the best option on the IHOP menu today! 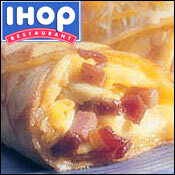 Two other varieties of Stuffed Crepes are available: Bacon & Cheddar, and Grilled Ham & Swiss. What do you think of Stuffed Crepes Supreme? These were very good. If you don't want the whole busload of eggs and pancakes JUST DON'T ORDER IT then you can be satisfied!